When I was a kid, like most children, I had a number of trucks, cars and tractors that I played with, but my favourite was the Tonka Trucks. They were big, bold, ran over everything and looked cool. Well Toyota is rekindling childhood memories with the reveal of a stunning concept vehicle that brings together the iconic Tonka and “unbreakable” HiLux brands. I had the opportunity to take a drive in the Toyota Tonka concept at the revitalised Eveleigh Technology Park, part of the ‘gentrification’ of Redfern and surrounds that has been happening over the last few years. There was a purpose built track for the demonstration that clearly showed the capabilities of the highly modified truck. A full-size dream toy for adults, the HiLux Tonka Concept is an impressive rock-crawling truck that combines the enviable reputations for toughness and durability that dominate the Toyota and Tonka DNAs. Unfortunately it won’t be available for sale. 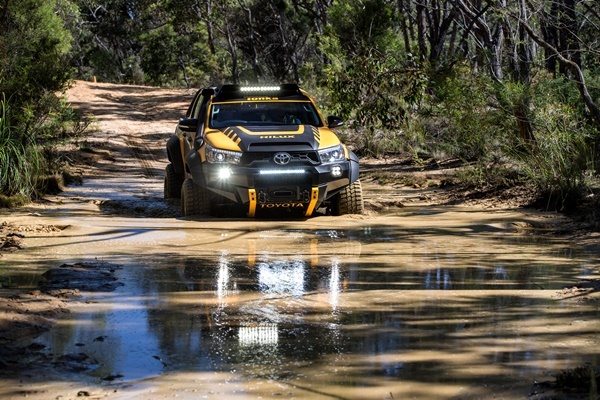 It was conceived, designed, assembled and tested by designers and engineers from Toyota Australia’s 150-strong product planning and development division.Product design chief Nicolas Hogios said the extreme style and capability of the HiLux Tonka Concept would capture the imagination of kids and adults alike. “We have taken Tonka out of the sand pit and reinvented HiLux from top to bottom and from nose to tail,” Mr Hogios said. 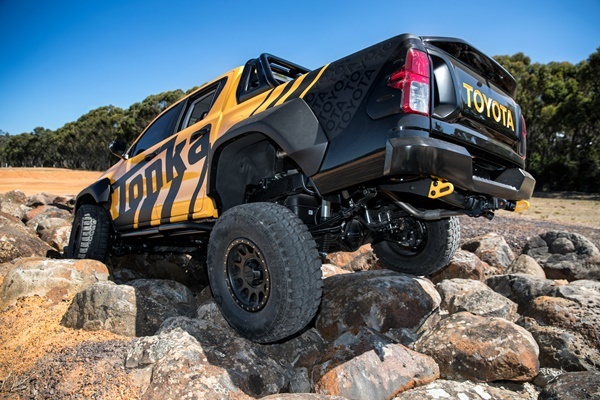 “Inspired by the Tonka trucks that kids play with in their backyards, the HiLux Tonka Concept goes way beyond the already hugely capable abilities of HiLux to traverse rocks and other rugged terrain,” he said. “The HiLux Tonka Concept is dramatic evidence that our local team loves to have fun, we’re keen to explore new ideas and we’re always looking to push the boundaries of what’s possible,” he said. 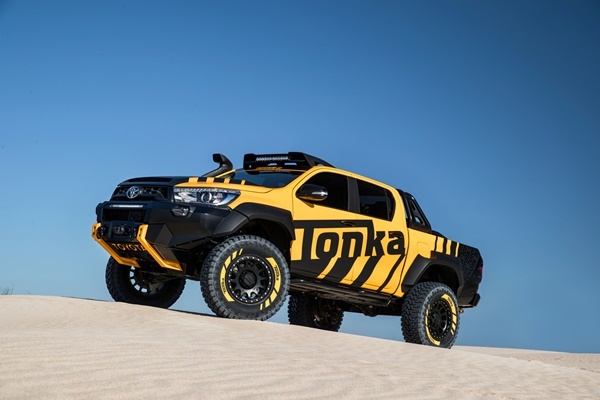 Underneath the dramatic black-and-yellow livery of the HiLux Tonka Concept is the top-of-the-range production HiLux – the SR5 double cab with a powerful 2.8-litre four-cylinder turbo-diesel engine. An extensive makeover starts with substantially extra ground clearance – an increase in ride height of 150mm (6 inches). Combined with a high-riding axle, heavy-duty suspension and 35-inch diameter tyres, the HiLux Tonka Concept is equipped to power over rugged terrain that would be off-limits to other off-roaders. A new front bar is compatible with the vehicle’s safety systems while the bonnet has a carbon-fibre skin and features an aggressive “power bulge” and air scoops. Tonka is a household name, celebrating its 70th anniversary this year. Equally renowned, Toyota is in its 80th year of incorporation and the HiLux was first launched in 1968. While the HiLux Tonka Concept is not destined for dealer showrooms, adults and kids alike will have the opportunity to share the dream as it tours 4WD shows, field days and expos around the country. I would love to take it touring in the outback or a trip to Cape York, a weekend trip to the farm or just about anywhere. 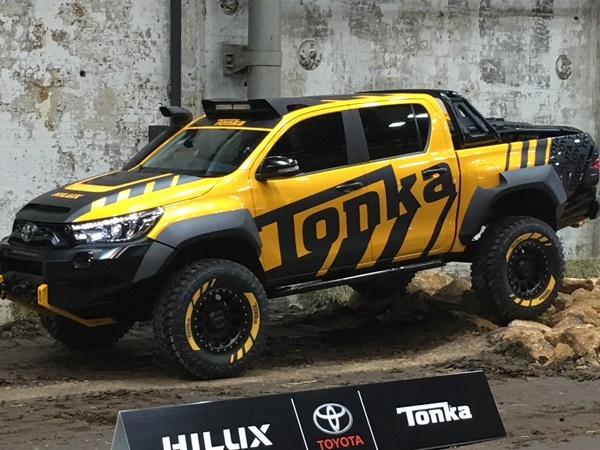 The HiLux Tonka Concept is highly modified, similar to many rock climbing vehicles, is awesome in design and implementation, looks really cool and would sell like hotcakes if Toyota ever decided to produce it. The concept car is based on a Toyota HiLux 4×4 double-cab SR5 model with the top-specification 2.8-litre four-cylinder turbo-diesel engine. No Recall for Great Wall and Chery a health worry?